Mini Converter UpDownCross HD is a full standards converter that lets you convert any SD or HD video format to any other SD or HD video format using high quality Teranex algorithms. Simply set the output format you need and the input format is automatically converted, protecting your equipment from receiving an incorrect signal. It’s also perfect for connecting HDMI computers to SDI projectors because it scales the computer’s video to the broadcast television output standard that you choose. 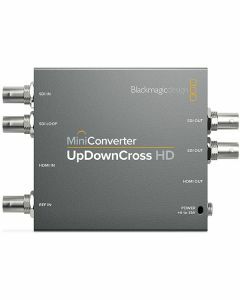 Mini Converter UpDownCross HD features multi rate 3G-SDI connections for working in all formats up to 1080p60 including Level A and B devices plus computer resolution scaling via HDMI in. You also get an HDMI input, reference in, audio delay for perfect AV sync, timecode conversion and both 3G-SDI and HDMI inputs and outputs allowing you to connect to virtually anything. Changing settings on Mini Converter's is as easy as using the built in function switches. This is great when you need to change settings quickly as there are no complicated menus to navigate. There’s even a printed switch diagram on each converter, so you never have to find the manual. You can also control settings using the included Converter Utility software by connecting the converter to any OS X or Windows computer. All models can be updated to the latest software via USB by simply downloading upgrades directly from the Blackmagic Design website and connecting the Mini Converter to your Mac or Windows computer. This means Mini Converters can be updated to include new video standards and technologies when they become available.